We carry a wonderful assortment of decorative redware, yellowware, and stoneware pottery to decorate those hard to fill nook and crannies, or occupy that empty space on your hutch or counter top. Most pieces boast the flavor of old time Americana, and can be used as serving pieces, vases, pots, or as a wonderful home accessory. Placemats, runners and napkins, in an array of colors and textiles, can be found throughout the store. From country checks to appliqued pumpkins and snowmen, we’ve got you covered for every season. 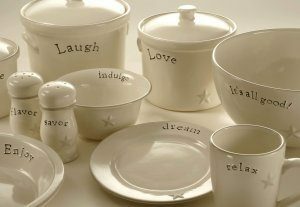 The sentiments on each piece of “Word Expressions” dinnerware are sure to put a smile on everyone’s face at the table! Every piece is oven, dishwasher, and microwave safe, and great for everyday use or entertaining. These versatile dishes are perfect for gift giving too! The serving tray says “Live, Laugh, Love” ~ the perfect reminder to do those things everyday. Sorrento’s raised dot-and-olive-leaf motif, and rich, earthy color palette compliment a wide variety of decor styles. Constructed of glazed stoneware, these dishes are Microwave and dishwasher-safe and designed for everyday use. 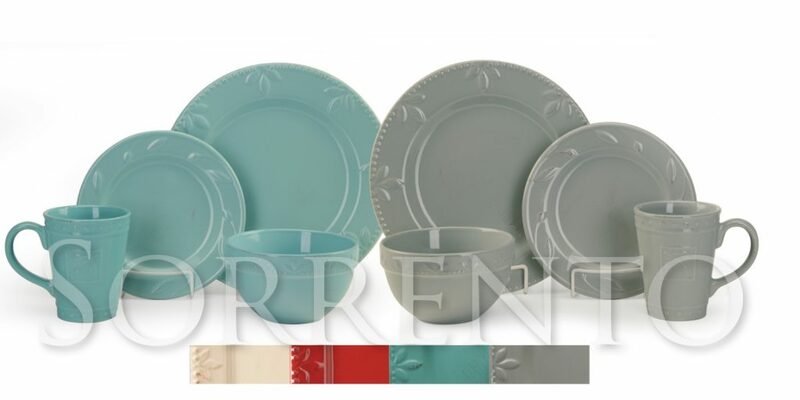 Choose from a variety of colors and coordinate your look with a wide range of Sorrento serving pieces and accessories.